A great gift for that hi-fi that has everything! We're a little shy of reviewing any kind of mains DIY components as mains electricity isn't exactly something one wants to mess with. 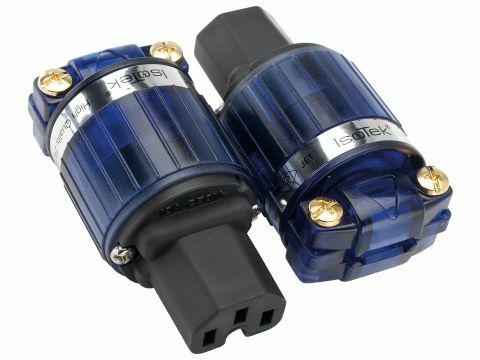 Still, just putting a plug on a cable is hardly rocket science and one of several reasons why this connector appealed to us is that it is very easy to fit without those embarrassing slip-ups that lead to blue flashes and awkward explanations. All mains cables thicker than 6A flex are a pain to work with, but IsoTek has provided both ample space for any amount of wire and a cable inlet that will accommodate wires as much as 14mm thick. In fact, cables with up to 20 square mm of copper could comfortably fit in the high-pressure clamps (locked down using a sensible-size screw head), and the overall cable clamp will securely grip anything down to bell wire, making this an IEC for all cables. It uses gold-plated copper and the body is made of tough polycarbonate plastic, which resisted cracking despite our best impression of a ham-fisted electrician in a hurry. And is it worth the trouble? The answer does rather depend on the cable you're trying to terminate. If it's bog-standard 3A flex than, frankly, no, you'll be hard-pushed to know the difference. If it's super-thick tweaky audiophile wire, you'll not be able to do a comparison with a standard IEC because the latter simply won't fit. But we did manage to find a mid-size specialist mains cable to try, which was enough to convince us that IsoTek's pricey connector (in fairness, the top Wattgate costs more) offers a subtle but worthwhile effect in tightening up the sound, particularly the stereo image. Sceptics may scoff, but the proof, as they say, is in the listening!